While working on the Thimbleweed Park cross stitch I had a crazy idea to immortalize even more of Thimbleweed Park’s characters on an afghan. When Team Thimbleweed’s Jenn Sandercock — who made the awesome trading cards — offered to send me an image file with all of the game’s characters in it, the idea went from “that would be wayyyy too much work” to “hey, I can really do this!” And the ThimbleCharts project was born. As I’ve started posting pictures and charts of the finished characters, I realized some Thimbleweed Park fans may want to try stitching a character but don’t know how to start. Just for you, here’s a “quick start guide” that gives the basics of how to get started with cross stitch. Before you start stitching, you need to acquire fabric, floss, needles, and a pair of sharp scissors. You can get these at a hobby store like Michaels or Jo-Ann Fabric, a specialty needlework store (Needle in a Haystack is an awesome source in the San Francisco area), or online. 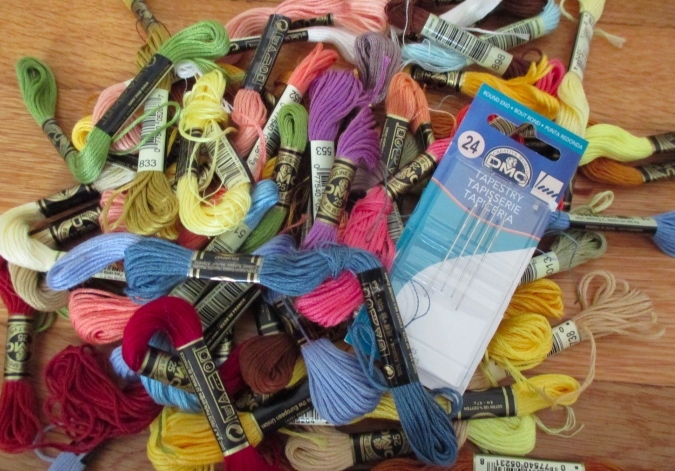 Floss: DMC is by far the most common brand of embroidery floss and should be available even in stores with the skimpiest selection of needlework supplies. For the Thimbleweed Park charts, one skein of each required color will be more than enough. Take a look at the legend on each chart to see which colors you’ll need for that design. Needles: You want tapestry needles, which have a rounded end so they won’t prick you in the finger. These come in different sizes — 24 is a good size for cross stitch. Cross stitch fabric is measured by its “count” — the number of threads it has per inch. If you’re new to cross stitch, lower count fabrics can be easier to deal with because the stitches will be bigger. The fabric count determines the size of your finished piece. For example, Agent Ray is 22 stitches wide by 72 stitches tall, which translates to 1.22 inches wide by 4 inches tall on the 18-count Anne Cloth I’m using for the afghan. As the count goes up, more of those stitches get crammed into each inch, so the finished size of whatever you’re stitching will go down. There are two categories of fabric usually used for cross stitch: Aida and evenweave/linen. Aida has thicker threads and tends to have a lower thread count (like 14 count, 16 count, or 18 count). Evenweave and linen have thinner threads and a higher thread count — 25 count, 28 count, and 32 count are common, but they go even higher. I often use 36 or 40 count for dollhouse needlework. As the name implies, a cross stitch is made by crossing one diagonal stitch over another to form an X. When you stitch over one, this means your X crosses over one horizontal thread and one vertical thread. Evenweave and linen can also be stitched over two, which means your X crosses over two horizontal threads and two vertical threads. Here’s an example from a baby afghan I stitched last year. Stitching over two is useful if you want to use evenweave or linen (better quality fabrics than Aida) and also want your finished design to be large in size. It’s also useful if the design includes fractional stitches that only take up one-quarter or three-quarters of a full stitch. (The cow has some of these.) My Thimbleweed Park charts *don’t* have quarter or three-quarter stitches, so if your only reason for reading this blog is to learn how to stitch one of those, forget I said anything about fractional stitches! A downside to linen and evenweave is that they may not have exactly the same number of threads per inch horizontally as vertically. Notice how the characters’ heads are tall and skinny in the first Thimbleweed Park cross stitch I did, compared to the round heads in the photos above? That’s because the linen I stitched on had an inconsistent thread count. If you prefer the look and quality of evenweave, try something like the 18-count Anne Cloth I’m using for the afghan, or a higher count evenweave stitched over two. Linen tends to have inconsistencies that may make stitching on it harder for a first timer. The Color Table legend tells you which symbol on the chart corresponds to which DMC floss color. The number in parentheses is the number of stitches the pattern contains in that color. Each square on the grid represents one stitch. If a square doesn’t have a symbol in it, you leave it blank. The gray triangles pointing in from the top and side of the grid identify the center point of the design. This is helpful if you want to center the design on the fabric. Another type of stitch called a half stitch may show up in some of the Thimbleweed Park charts (most likely only the ghosts). This is exactly what it sounds like: half of a cross stitch. Instead of stitching two legs to form an X, you only stitch one leg. If a pattern includes half stitches, they will be called out on the legend like the backstitches are. All of my Thimbleweed Park charts say “Cloth’s Color: White” on them. That’s a setting I couldn’t figure out how to turn off. I’m actually stitching on natural colored cloth, which provides contrast for white areas like the Coroner’s lab coat. If you do stitch your characters on white fabric, you may need to backstitch around the white areas to help them stand out. First, sew around the edge of the fabric with a sewing machine or wrap the edge in masking tape to keep it from unraveling. If you’re planning to frame your finished piece, you should leave an approximately 3″ margin between the edge of the fabric and where the design starts. Organize your floss before you start stitching. One way to do this is to unravel the floss and put it on a bobbin (available for sale along with the floss and needles and everything else). When the floss is on a bobbin, you cut off lengths as you need them. You can keep the bobbins for a particular design together in a ziplock bag or with a metal binder ring inserted through the holes. Another option is to put the floss on a card. I make these myself with a hole punch and an index card. If you’re using a card, cut the floss into approximately 18″ lengths. DMC floss has six strands that can be separated. In most cases you’ll want to use two strands of floss to adequately cover the fabric. The exception is if you’re stitching over one on high count evenweave or linen — the stitches get to be so small that two strands are too bulky. I used one strand when I stitched the original Thimbleweed Park cross stitch over one on 32 count linen, but I’m using two strands on the 18-count Anne Cloth. As long as you’re using two strands, the “loop method” is a good way to start your stitches. This involves threading one long piece of floss so both ends stick out of the hole in the needle. Here’s the front of the fabric after the first leg has been stitched. And here’s the back. Stick the needle through the loop as you draw it up. When you pull the thread tight, this creates a secure stitch that can’t fall out. I especially like it for the afghan since the back will be open when it’s finished, which puts the stitches at risk of pulling out. If you’re only stitching with one strand or you don’t want to use the loop method, leave a long tail with your first stitch. You can stitch over this with subsequent stitches, to secure the tail. As you stitch, it doesn’t matter which corner you start from as long as you’re consistent — all bottom legs should go in the same direction, and all top legs should go in the same direction. The bottom leg of my stitches always goes from the bottom left to top right. Start stitching in an area that has several stitches in the same color clustered together. I usually start the Thimbleweed Park characters at their shoes. When you’re ready to change colors, run the thread underneath several stitches to secure it, and then snip it. And… I think that’s it! Everything you ever wanted to know about how to cross stitch, and some things you probably didn’t. I hope this write-up will give people who are on the fence the nudge they need to try stitching some Thimbleweed Park characters. If you do, please let me know in the comments!